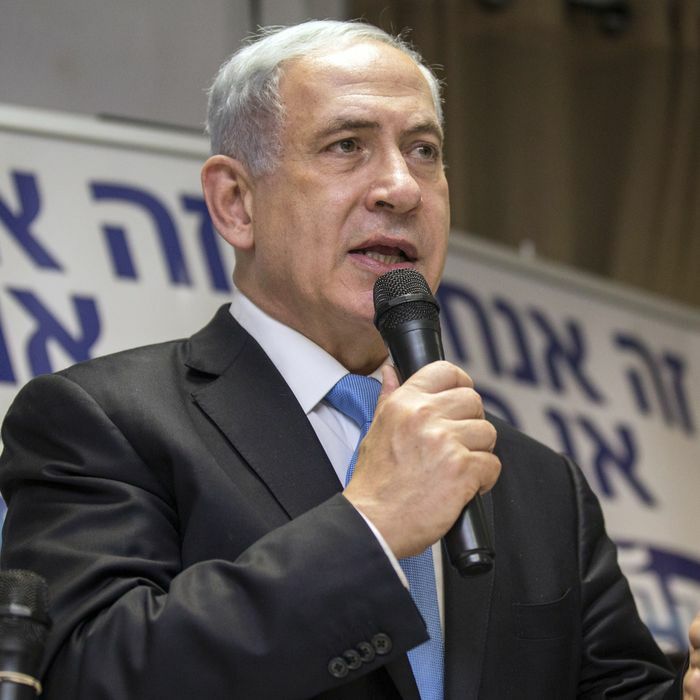 As Israelis prepared to head to the polls and vote, Prime Minister Benjamin Netanyahu seems to have settled on a panicked swerve to the right as his best hope of holding on to power. The turn has been violent enough to send his long-standing state position in favor of a two-state solution flying out the window like a piece of loose baggage. By Monday evening, the embattled incumbent had not only unexpectedly reversed himself on supporting the existence of a Palestinian state — one of the most fundamental issues in Israeli politics — he also publicly vowed to expand settlements in the occupied West Bank, and warned of a sinister Scandinavian plot to topple his government. That was all before posting a video warning that “Arab voters are streaming in quantity to the polling stations” — a development that, he said, threatened “right-wing rule” in Israel. The latest polls shed some light on why the man once crowned “King Bibi” might be feeling desperate: His Likud party trails its main challenger, the Zionist Camp, by four seats — a sizable gap in a 120-seat parliament. But the prospect of losing the election doesn’t seem to have energized Likud’s conservative base: The prime minister had to cancel an event last week in Ashdod, a party stronghold, when organizers could not find enough people to fill the hall. Instead, most Israelis are exhausted with their leader. On the issue that most animates a large swath of the electorate, the high cost of living, Netanyahu offers few solutions. Likud has not even bothered to publish an economic platform. A series of embarrassing personal scandals in the official residence, from a bloated budget for makeup and hairstylists to a penchant for gourmet ice cream, have not helped. Could Netanyahu Actually Lose His Reelection Bid? So rather than trying to attract moderates, Netanyahu seems to have decided that Likud’s last, best hope is trying to siphon votes from three would-be coalition partners at the far-right fringe of Israeli politics. All three parties — Yachad, Jewish Home, and Yisrael Beiteinu — have been locked in a competition for the title of Israel’s most extreme. At the last minute, Netanyahu and Likud have joined the fray. The about-face on a two-state solution Monday was the prime minister’s most dramatic gambit yet. “I think that anyone who moves today to establish a Palestinian state and surrender territory, they’re giving radical Islam space to attack Israel,” Netanyahu told the conservative newspaper Makor Rishon, reversing a position he publicly endorsed in a major 2009 speech. Earlier in the day he toured Har Homa, a Jewish settlement in occupied East Jerusalem, and vowed a wave of new construction. Last week he accused a wealthy newspaper publisher of conspiring against him, and told supporters that foreign governments, “especially Scandinavia,” were bankrolling the plot. At times the self-proclaimed leader of the Jewish people seems to be alleging the existence of a global Jewish conspiracy. Netanyahu called for this vote in December, after the center-left members of his coalition refused to vote for a controversial bill labeling Israel the nation-state of the Jewish people. “I hear ultimatums, diktat and threats … a country cannot be run this way,” he said. With early polls showing him the clear favorite to win, he gambled away the second half of his four-year term. The campaign has been intensely personal, with candidates leveling charges of racism and corruption. Serious issues have gone largely ignored: Until Netanyahu’s unexpected remark today, almost no one was mentioning the Palestinians. In Israel’s complex political system, it is the party with the best chance of forming a coalition, not the largest party, that is tapped to form a government. Herzog has an uphill battle: He would have to unite a number of parties that have vowed not to sit together. Netanyahu has a clearer path to a coalition. A third option, bizarre as it sounds, is that President Reuven Rivlin could urge both rivals to form a unity government, a shotgun marriage that nobody expects would endure a full term.